Maryam Soomro/Business Manager Students write code during the 24-hour HackBU hackathon, which took place in the Innovative Technologies Complex on Saturday and Sunday. 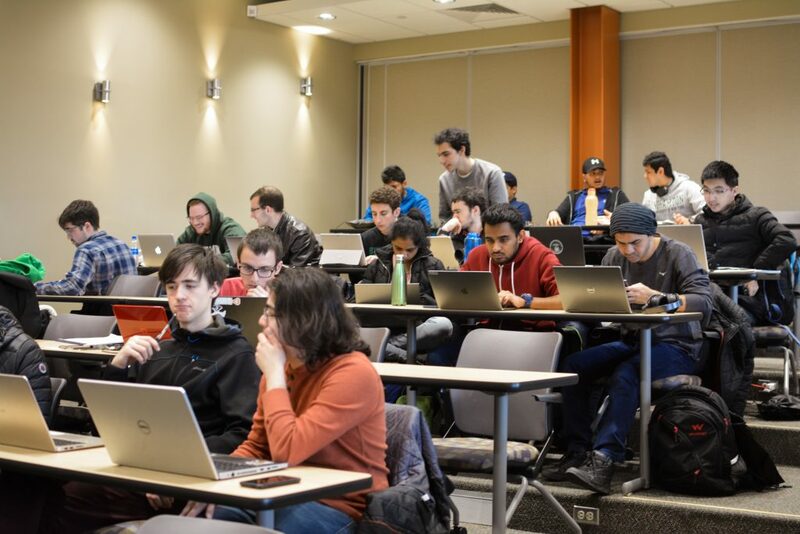 The sixth annual 24-hour HackBU hackathon took place this weekend, giving the opportunity for Binghamton University students and students across the Northeast to demonstrate their hacking skills. The hackathon, which took place at the University’s Innovative Technologies Complex, began at 11 a.m. on Saturday and ran until 4 p.m. on Sunday. This year’s HackBU brought together around 350 collegiate students across the Northeast, including students from BU, Cornell University, Rochester Institute of Technology and Clarkson University. The influx of students from other participating schools was a result of the event’s new advertising campaign, according to Melanie Chen, one of HackBU’s organizers and a senior double-majoring in computer science and music. Chen wrote in an email that a primary goal for this year’s hackathon was to attract students unfamiliar with programming and coding. The event also hosted beginner’s workshops, which Chen wrote was an effort to make the event more diverse and welcoming. HackBU is sponsored by companies like Citibank and Viacom, and allows participants to win prizes while meeting employers. The event’s organizers also partnered with local businesses to provide food and amenities, including Moe’s Southwest Grill, Maryam’s Mart, Nezuntoz Café and the Hot Yoga Spot. Stephen Black, an undeclared freshman, said the teamwork aspect of the event drew him in after his friends asked him to participate. Tamir Cohen, a senior majoring in political science, created a 2D game for the hackathon. Cohen said the event provides valuable experience in teamwork. Numerous awards were given following the hackathon, including “Best Civic Engagement Hack,” “Most Viable Business,” “Best Security Hack,” “Most Technical Hack,” “Best Newbie Hack,” “Best Design” and “Funniest Hack.” The “Best Mobile Hack” award went to “Night-Ride,” a ride-sharing app similar to Uber and Lyft. Tyrone Gonzaga, a sophomore majoring in computer science, was a part of the team behind “Night-Ride.” Gonzaga, along with teammates Matt Reid, Joseph Raskind and Randy Giron, sophomores majoring in computer science, created the app with students in mind.